I had my 8 foot Diamond Professional installed yesterday and I am extremely happy with the table and the installation team. There were a couple of issues along the way with this table order which were completely on the Diamond Billiards end but Heath always took full responsibility even though these were issues at Diamond that were beyond his control. Heath went out of his way to make sure I was happy at the end of the day and even with a last minute issue (a mistake by Diamond), Heath came up with a solution so everyone was happy. The table is pristine and well worth the wait and overall I am happy with my new Diamond Professional. 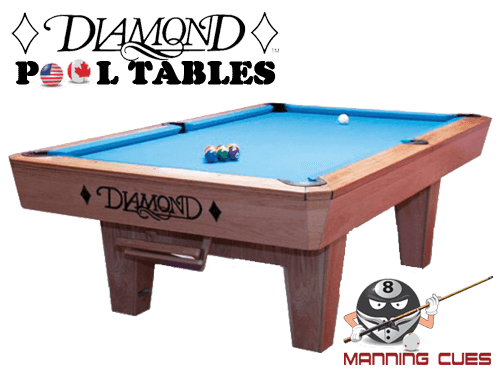 This is a review of my recently received Diamond Professional 9' table purchased from Manning Cues and especially the customer service experience of dealing with Heath Manning. In a word, the table is superb, just what was expected in every respect. Given Diamond's reputation in the industry, I would have expected no less. What really stands out though is the incredible customer service provided by Heath Manning at every step of the process. Heath helped me through the process of selecting various options for the table and was very generous with his time in offering help and advice. Then, in a manner which is all too rare these days, he (and Diamond) proceeded to do exactly what he said he would do exactly when he said he would do it. Every deadline was met or surpassed. The table went into production, was shipped, and delivered on time and as promised. Heath was checking in with me and updating me on the order status every step of the way. Advantages: Buying a $6k pool table over the internet from someone you've never laid eyes on may seem like a bit of a risky maneuver, but my experience with Heath should put your fears to rest. 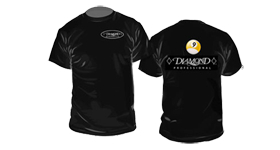 See above comments about both the Diamond product and the customer care provided by Heath Manning. I'm the proud owner of a brand new Diamond 8' Professional. In the past I've owned Brunswicks, Olhausens, and off-brands. The difference in quality is obvious - this is the best table on the market right now. It is absolutely beautiful. I had questions. Lots of them. I called and e-mailed in the morning, late at night, it never mattered, Heath would respond immediately. He loves his job, and it shows. You won't meet a nicer more helpful guy. Once the table was ready, delivery was scheduled, and within a few days I had one of the best pool table techs in the country putting together my table. His attention to detail and need for perfection were ridiculous. Absolutely amazing. I couldn't be happier with the entire experience. And at the end of the day, I'm fairly confident I have one of the nicest tables in Austin right now. I've been a long time customer of heaths, but only of small products like cues or wax. This is my first diamond table ever and I can honestly say everything was great. The installation was done by diamond experienced table mechanics, and Heath was very responsive and pleasant. He always opted to call rather than email me, which I think shows a lot about his care for his customers. The charges for installation and delivery were also reasonable and better than most other dealers i spoke with.